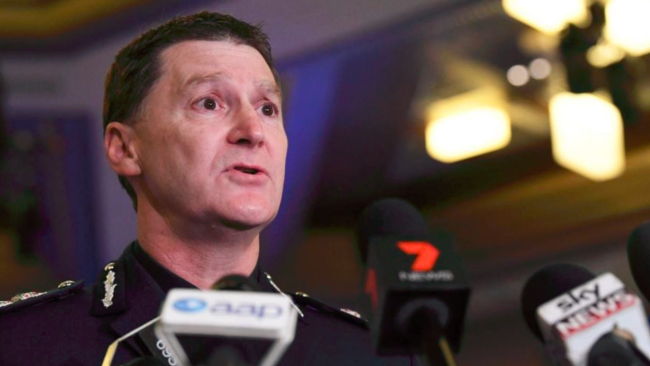 “This is not about ethnicity, it’s not about people’s background, it’s not about religion, it’s about their behaviour, so any conversation that goes on around ethnicity needs to be squashed”–Inspector Marty Allison said. AT LEAST 16 pedestrians have been struck by an out-of-control car on Flinders St between Elizabeth and Swanston streets this afternoon. The driver of the car has been arrested by police. Two people taken to hospital so far. One is a toddler with serious head injuries. Up to 19 people have been injured after pedestrians were mown down by a car near the corner of Flinders and Elizabeth streets in Melbourne’s CBD. A white SUV showed no signs of slowing as it mowed down a number of people at the busy intersection. Police have arrested the driver of the car. An officer at the scene has described it as a terrorist incident, but this has not been confirmed. Police are asking any witnesses to go to the Melbourne West Police Station at 313 Spencer Street, Melbourne and all vehicular and pedestrian traffic to avoid the area. A pre-school aged child is among the injured. The child who a head injury has been taken to Royal Children’s Hospital in a serious condition. Paramedics are assessing 12 other people at the scene. Two other people have been taken to hospital, an Ambulance Victoria spokeswoman said. Another person has been taken to The Alfred hospital but their injuries and condition is not yet known. A mob of unruly young people recently turned up at Werribee house party, where they trashed the place before rampaging through nearby streets. When police arrived, they were pelted with rocks. Pepper spray residue, blood splatter, graffiti and broken glass were left in the extensively-damaged three-bedroom property, while some walls had holes kicked in them. Terrified neighbours cowered in their homes at the height of the violence, trying to avoid the gangs, who used poles to smash car windows and tried to kick down doors. Friday dawned to reveal cars along the street with smashed windows and rocks littering the road. Neighbours say up to 40 youths from the house started roaming the streets, throwing rocks and smashing cars. This is terrible. Who are these youths? Where did they come from? It’s understood two gangs of African youths, one known as Westside Crew and another as Menace to Society, were involved in the riot. Inspector Allison said the cultural backgrounds of those involved in the violence was irrelevant, after suggestions from residents that youths with African backgrounds were being protected by police. Inspector Allison defended the initial police response to the incident, and the fact that no arrests were made. Residents said they were staggered many of the youths involved could be seen at a bus stop less than 100 metres from the carnage shortly after being dispersed by police. “Victoria Police is not soft, we do use the appropriate force, but we have to balance people’s human rights,” he said. Mr Patton also said “different sections of the community” would oppose Victoria Police using water cannons to handle similar riots in the future. That “different section of the community” would be rioters, who presumably oppose any punitive or preventative response. The house was scrawled with tags linked to the notorious Apex gang and new African youth group called “Menace to Society”, but Mr Patton repeated police claims that Apex no longer exists and dismissed the MTS gang. “Well they (brawlers) are a menace to society in the way they’ve conducted themselves … but we have no intelligence that such a gang exist,” he said. Apart from the ruined house, all of those smashed windows and the accounts of witnesses. No evidence at all. Bollards don’t seem to be helping. Presumably the only way to prevent these attacks is to destroy more freedoms and keep all cars out of the city. I can’t wait for driverless vehicles. Load them up with explosives and send them into town with GPS coordinates. I suppose the downside is that Islam won’t have another martyr to boast about. Anyone remotely involved with violence against this nation should be deported immediately with no appeal permitted. 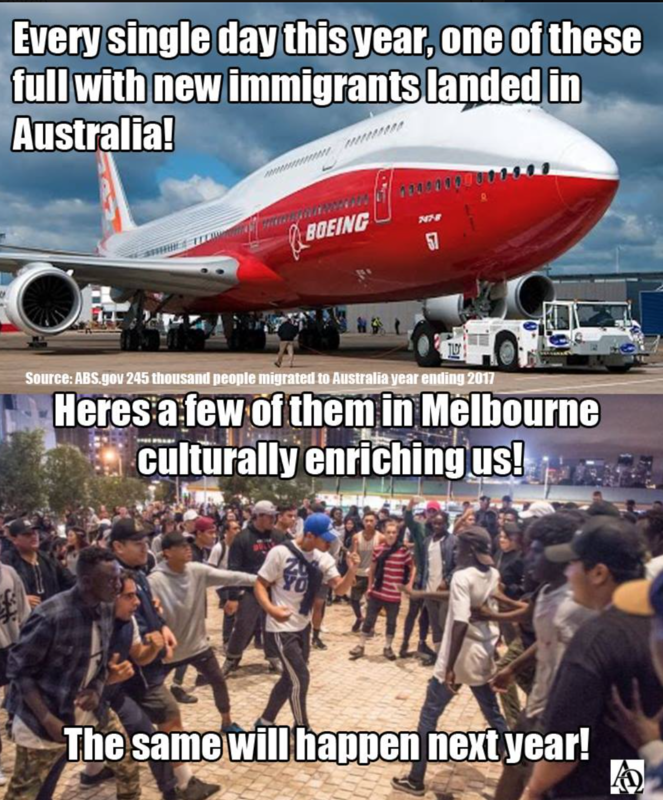 Of course, you silly hatefully racist bigots! Don’t you know yet that all criminals only have rights – to be treated with PITY, as fellow victims – as well as to your stuff, because you are too privileged to hold onto it?! And further, while you have no rights to become ANGRY (“Hateful!”) to defend yourselves from them, you also only have a responsibility to become and remain their slaves?! Suicidal masochism is just the right thing to do! It’s for your own good! Think of THEIR children! WHEE!